Disclaimer: this post expands on ideas I wrote about in a three part series of posts called "Filling the Void". I'll try and keep it as general as possible and even if you haven't read it you'll be able to read and understand what I wrote below. But if you are interested to go deep into this, you'll find PART 1 about character creation here, PART 2 about combat here and PART 3 about scarring characters (use of ability scores/qualities) here. That's the first attack of the 7 goblins ambushing the heroes. Let me explain this a bit. 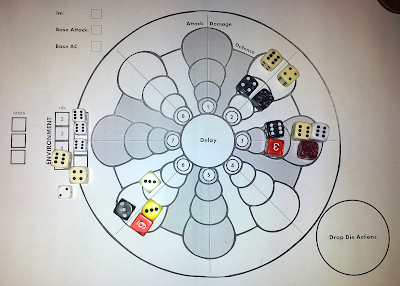 The basic rule is that every rolled six (of the initially rolled dice) generates a new d6. 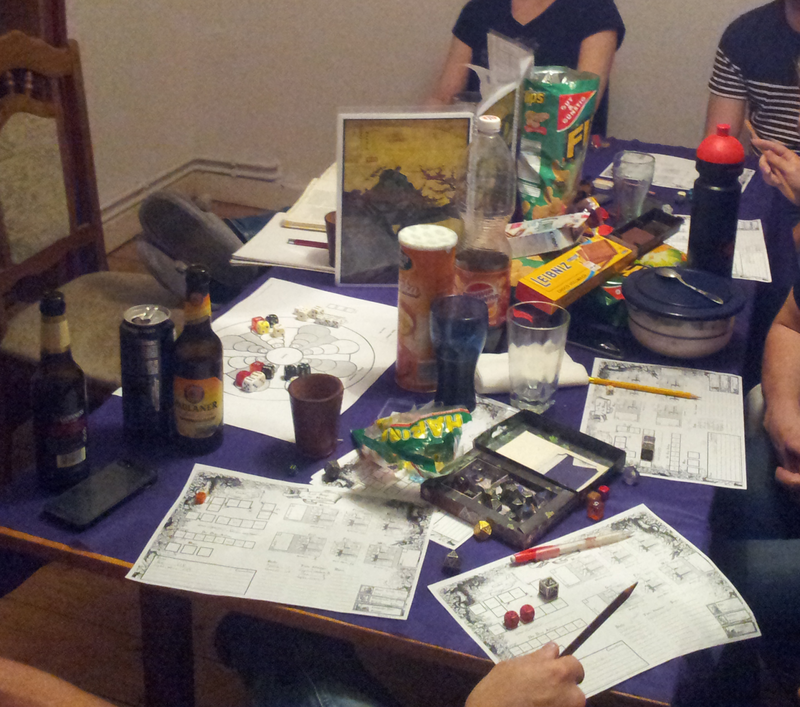 Environment is only rolled at the beginning of an encounter and I used 3 dice (moderate complex forest). Monsters can use environment dice as advantages in a fight as soon as they roll corresponding numbers. So in this case they could trigger with 2, 4 and 6 and add it to their actions to move around, for defense or attacks, just as I needed it and the dice allowed (as a side note, environment just adds the value and doesn't count as double or triple). As you can see, they were in for a beating. Fate decided which of the 7 level zero characters got attacked first and three had been unlucky enough to not make their rolls. The picture above shows 5 attacks by 7 goblins on 3 characters. I won't go into detail, but let me just say that this worked very well to make those buggers and their surroundings come to live. They run for cover into the bushes, jumped from trees and rocks, used them as cover and cooperated with each other. As one of the players put it, it's unheard of to let monsters work that tactical with their environment and with each other. They should just attack and die (he had been the designated tank of the group, but failed to be fast enough to intercept those goblins most of the time, so some of that might have been frustration). All in all it had been a fair fight. The goblins had no chance at all, but fought to the end (as morale indicated) and fought well (one character will remember this fight by the scars she took from a mean spear wound that almost got her killed). I think this went really well. The dice tell the way like an oracle. A bad roll might correspond with the environment or might help another goblin move into safety or do more damage, not just because I say so as the DM. There are almost no arbitrary decisions, it's all interpretation. If nothing else, it really supports the way I like to run a game and the players enjoyed it a great deal, too. So one player asked me how animal companions are handled in the game (since she likes to have those) and it had caught me a bit by surprise at the time. I'm generally not a fan of having a record sheet for everything or the level of detail that goes with it. 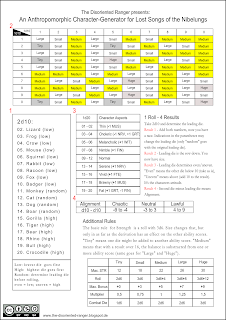 Do you need all those stats for your character's horse, dog and henchman? I don't think so. They have a few functions in the game and that's where they should count. Long story short, I decided that they work like environment works for monsters. 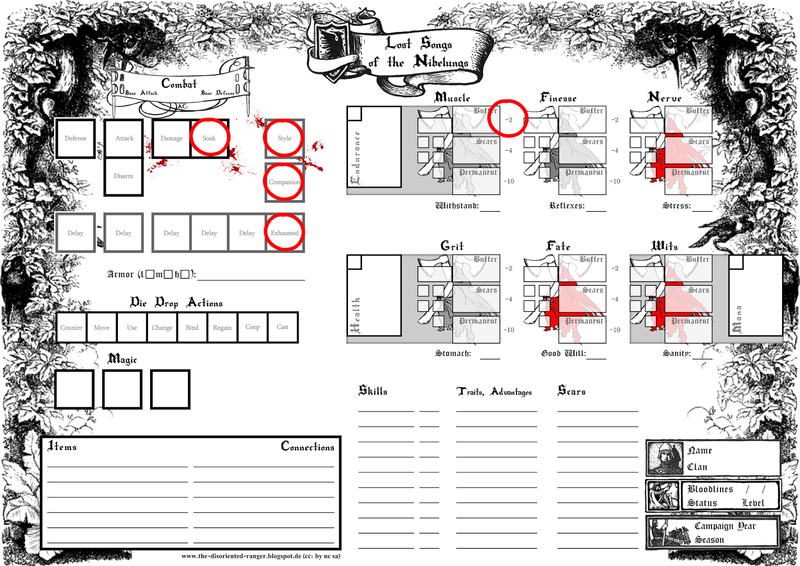 Before an encounter a character rolls one die for his companion. A 1 is discarded, a 6 generates one new die. The result stays that way for that encounter. 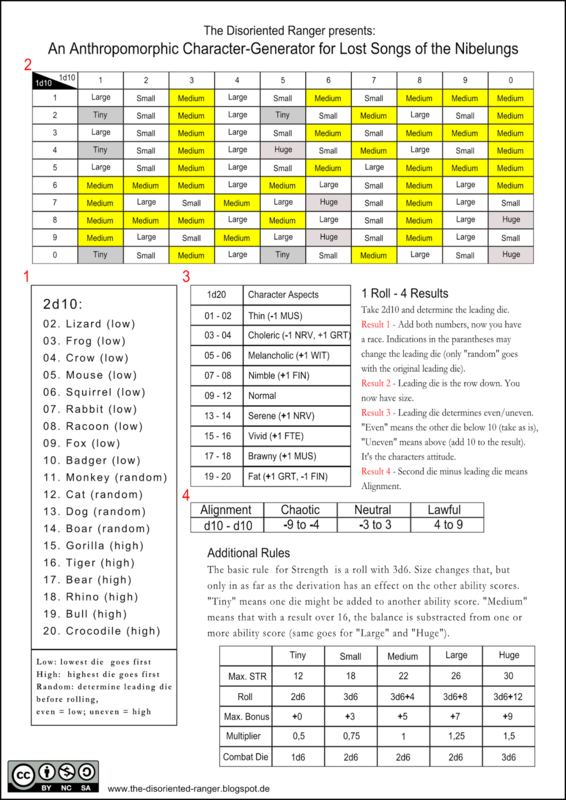 If it's a 1, the animal is not responsive, every other result may be used if the dice correspond with the combat dice the character rolled or if a drop die action is spent to issue a command (which is especially useful if a companion ended up with two dice). Corresponding dice may be used for all actions, but do not produce doubles or triples. "Style" mostly works just like companions do. It's a combat style a character learned and also a static that is determined before an encounter. Depending on how that fight turns out, a style might be more or less effective that way. 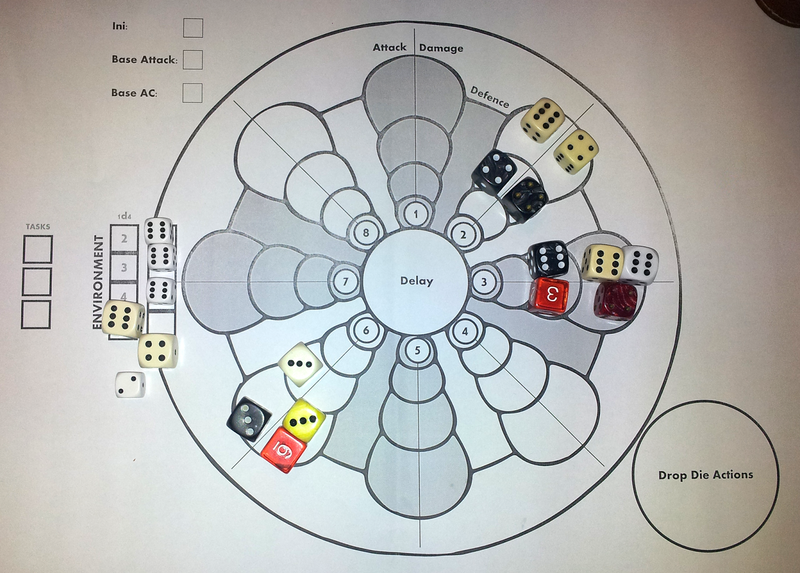 Since a style may only be used for combat actions, corresponding dice do count for doubles and triples. If you are able to use a style in combat, it will have an impact. "Exhaustion" (indicates a character looses a combat die) and "soak" (characters may soak incoming damage instead of doing it) are no new concepts. 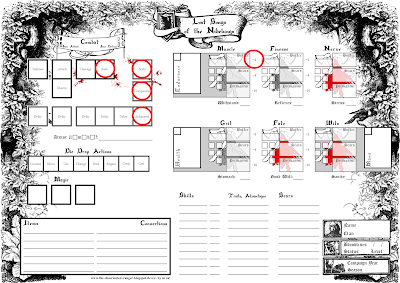 They just needed a new home on the character sheet. The last new addition is giving a fixed disadvantage for the different stages a characters qualities could be in. It's nothing special, but necessary to give those changes an immediate impact. All of this got tested in this little encounter. One character had two companions, another had just one and they turned out to be useful without making a character too powerful. They also made for an interesting change in the flow of the fight and the narrative that resulted from it (first character rolled a 1 for his owl and the bird got disoriented and was no use in the fight, the other character used her falcon to hunt down some goblins who thought themselves clever enough to hide in the bushes, stuff like that). Players liked it, too. As far as damaging and killing goes, the system responded as it should. One character had a bad save on Good Will and already lost some fate in the process. She was one of the three getting attacked first. She caught two strong hits. The first one almost got her unconscious, but she stomached it (successful save Stomach vs. 20) and pushed on with a -4. That second hit pushed her way too much into permanent damage. She had to decide to either take it or deplete her Fate even further to compensate the damage (risking ill fortune, just like Nibelungs are supposed to). This proposed an interesting problem, since the player said this might result in a fate far worse than death. Sometimes, she mused, dying needs to be a viable option. I honestly hadn't thought of that and I think it's a minor problem. People will try hard to stay alive as soon as their characters have some levels under their belts. I have to think about this a bit more and testing will help sorting the rest out. For now it's an option a player has: take the hit and be crippled or loose Fate and risk the gods ill will. This is more text than I thought I'd manage to come up with (that damn heat! ), but anyway, I hope you all got some ideas out of it. So far testing this game is quite satisfying. It does what it's supposed to do and problem are fixed easy enough. Combat turns out to be the main feature so far. It's detailed, but random. Decisions do matter, but there's also luck, interpretation and some bluffing. For the players knowing the potential of what might happen in a round opens up a lot of possibilities and really helps in letting a fight come to live. We took our time with this and there's still lots of potential to improve the system, the combat sheet and the character sheet. 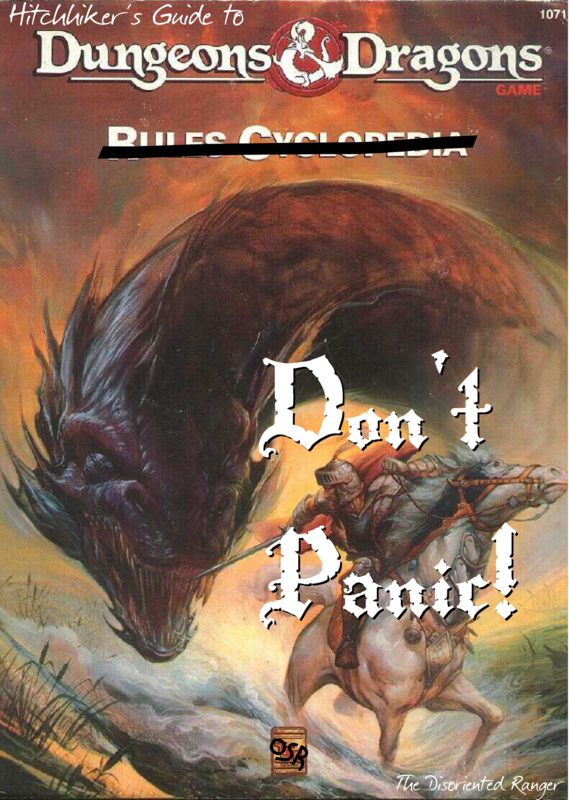 I have an idea how I could streamline and coordinate the DM's work with the monsters a bit more (the combat mandala has a special place in my heart, but there might be a better solution). I also keep forgetting Endurance, so I need to do something about that (since I believe it important, but maybe for the wrong reasons ...). Questions and comments are very welcome, of course. In my opinion, the best Bitcoin exchange company is YoBit. The Week of Vengeance is upon us!